As we mentioned in the previous blog on Wall Aesthetics, in addition to looking good, the walls of your house need to perform three very important functions; structural, thermal protection and moisture protection. We will focus on the second two, as they are both at the core of how modern residential building science is improving home construction. Framed walls ready for insulation. The American Society of Heating and Air Conditioning Engineers (ASHAE) was founded in 1894, and the American Society of Refrigerating Engineers (ASRE) was ten years behind in 1904. In 1959 these two merged to form the American Society of Heating, Refrigerating and Air-Conditioning Engineers (ASHRAE) Obviously the Department of Non-confusing Acronyms (DNA) has yet to be formed in Washington. Prior to the 1973 energy crisis, the topic of building passive houses was far from the mainstream. The ideas were nurtured by those with primarily scientific concerns, producing often unusual building designs that responded to severe desert or very cold environments. The Energy Reorganization Act of 1974 created the Energy Research and Development Administration (ERDA) and by 1977 this was consolidated with several other government energy related organizations under the Department of Energy Organization Act. DOE was born. Now with the engineers aligned, the regulatory agencies formed and empowered to codify, and the newfound sense of urgency surrounding energy efficiency the movement gained mainstream momentum. By 2000 the International Code Council created the IECC (International Energy Conservation Code) which has been updated every 3 years since. As of this writing most main stream jurisdictions have adopted either the 2012 or 2015 version, and many will shortly adopt the 2018 version. The IECC begins with a Climate Zone map that breaks the United States into 8 climate zones. Based on the zone that your house is in you will have differing requirements with regard to the building envelope. Exterior wall in process of adding siding. The green panels are ZIP sheathing with integrated water barrier. If the three little pigs were to be re-written in the 21st century, the pigs would be forced to address their structural issues by a rigorous building code that would enforce all types of shear design regulations to guard against ominous earthquakes and gale wind forces. Rather than a wolf being the villain in this story, the pigs would be living in fear of mold spores and a senseless waste of resources expended to keep our little friends both in comfortable air conditioning. In the 21st century the two primary concerns in wall design are temperature and moisture. Whereas the pigs’ safety resided in a strong brick box, they would now be looking at the problem of building a sturdy, and beautiful, thermos. One of the slightly frustrating aspects of thermal design has to do with how indeterminate it is. The initial problem is simple enough, design an efficient building envelope (thermos) and then appropriately size a heating and air conditioning system to keep the interior temperature and humidity relatively stable. This can get complicated very quickly by both the wide range of exterior conditions and by the variability of how many occupants are using a building and how much heat and humidity they are producing as they use the building. Finally add to this the varying perceived levels of comfort by the occupants. That’s probably why the three bears left the house in the first place. To design a better wall, you need to know the criteria on which you will be judged. This can get very granular, so we will keep it to the basics with regard to temperature, moisture, and air tightness. R VALUE: The ability of an insulating material to resist heat flow. The higher the R value, the higher the insulation power. Technically it is the rate of heat transfer through a material. A typical wall might be insulated to R-21. U FACTOR: The U Factor is the inverse of the R-Value. It has traditionally been used to measure the flow of heat through windows in housing design. The lower the U, the better the insulative ability. DEW POINT: Temperature (varying according to pressure and humidity) below which water droplets begin to condense and dew can form. There are several values that effect at what temperature this will occur. With regard to wall design this is very important in that the dew point temperature will occur inside of your wall, so you want to make sure that even in extreme cases (coldest and warmest days of the year) that this will not allow water to form and get trapped in your wall cavity. This will result in mold growth. PERM RATING: The rating used to measure how vapor impermeable a vapor barrier or vapor retarder is. Typically, a vapor barrier will have a perm rating of 0.1 or less and can also be called a Class I Impermeable Vapor Retarder. A Class II semi-permeable vapor retarder would have a perm rating of between 0.1 and 1.0. A class III permeable vapor retarder would have a perm rating of between 1 and 10. This will measure how much moisture will be able to penetrate your wall system. ACH (Air changes per hour): Number of times in an hour that the volume of air in the house is changed. Basically, any house will leak air. If you think about it every time you leak air, you need to either heat or cool the new air that replaces the leaked air. It’s a little bit like blowing up a balloon that has a few tiny holes in it. If you have enough holes the exercise can become futile. You could have all of the insulation in the world but if you leak away the air the insulation becomes pointless. PASCAL (SI): Unit of pressure used to quantify internal pressure or stress. This is the unit by which a Blower Door Test is based. Though it is fairly technical it is worth understanding that the air pressure directly affects how quickly the air will move through small leaks and openings in your wall. SI would be the assumed pressure that your wall should be able to meet its performance requirement. To further complicate things, a designer must deal with peak loads on the HVAC system so that the home can remain comfortable on the warmest and coldest days of the year. Peak Loads can be influenced more by heating or cooling based on the location of the house. This will have an impact on the wall design and its detailing. Cold Dry climates would require a great deal of insulation. Warm Humid climates, would still want insulation, but moisture management becomes a very critical component. The wall design hopes to keep the total energy load to a minimum. The strategy being to design the wall in a manner that will make the houses ability to passively maintain its interior comfort levels so that the active systems can be sized more efficiently. In your effort to design a wall that protects the occupants from temperature and moisture, you will be dealing with what you see on each finished side, as well as the design of the inner layers of the wall. We need to stop both bulk water (rain) and water vapor (moisture) from getting into our system to avoid rot and mold. We also need to insulate our wall system, as well as make it air tight to keep the interior temperature stable with minimal energy consumption. Speaking strictly about energy efficiency, the number one thing you can do to reduce your heating and cooling is to build an air-tight house. This is even more important than insulation! From inside to outside, the typical old school wall would have been composed of ½” drywall, then 2x4 wood studs placed at 16” on center, then 7/8” OSB or plywood sheathing, then a Tyvek house wrap (vapor barrier) and finally some type of vinyl, wood or cementitious siding or a masonry veneer. The stud cavities (space between the 2x4 studs) would be filled with Batt Insulation giving you an R value of between R13 and R15. A version of this wall dominated US home construction from the early 1970s until the 2009 IECC (International Energy Conservation Code) required an improvement to its performance. The code acknowledged the importance of “thermal bridging,” which was the point that each of those studs touched both the interior and exterior faces and interrupted the insulation. 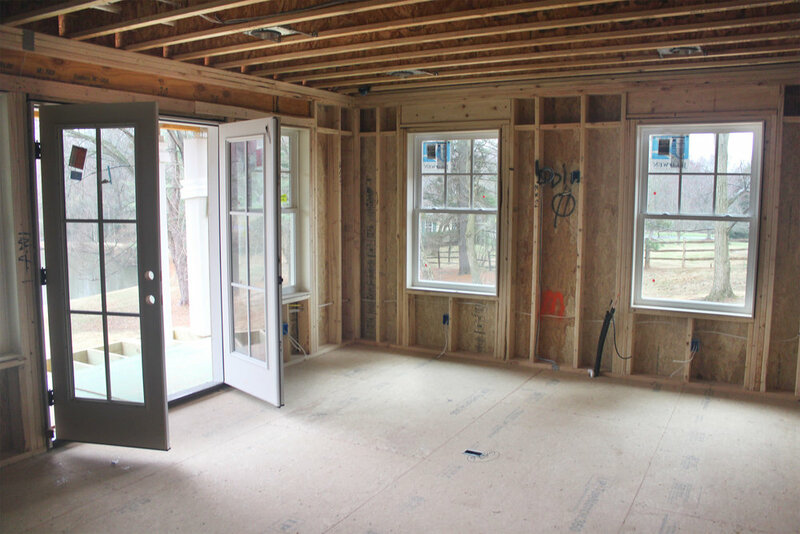 IECC would require that the wall studs either increase to 2x6 (resulting in more space for insulation), OR they could remain at the 2x4 IF an exterior sheathing with an insulation value was used. The trade off is that a 2x6 is more expensive than a 2x4, but simply using Batt insulation in a 2x6 wall ends up being cheaper than buying and installing that exterior insulation. From a thermal performance standpoint, the 2x4 wall with exterior insulation is superior to the 2x6 wall with cavity insulation only. The exterior is what you see on the outside and is thus wholly related to the aesthetics of your house, as covered in a previous wall aesthetics post. From a performance standpoint the exterior siding physically protects the assembly from wind and the majority of the rain (bulk water). Given the near certainty of water getting behind the siding, it is more commonly accepted today to install the siding with an air gap behind it so that intruding water will flow out or dry out before entering the interior. This can be done as a cavity wall or a rain screen, and although it is not the standard practice in the Mid-Atlantic region (yet) it is required by building code in some of the rainiest climates in our country, like the Pacific Northwest. Just behind the exterior you will typically have the vapor barrier or retarder. This is basically a wrap that will keep moisture from entering your wall system. In so doing it will mitigate the problem of having moisture condense inside of your wall. The critical problem with these building wrap products is making sure that they are sealed at all penetrations and building breaks. It is important that your architect specify how these details should be executed, and that your builder performs this work exactly as detailed. The middle of the wall system usually contains the structure which in most houses these days is wood studs. Since the structure creates cavities the middle is always a place to build up the insulation and thus the R-value of the wall. This is often done cost effectively with either batt or blown-in cellulose insultion.Unfortunately, if those studs touch the exterior you will create a thermal bridge at each stud. This is best dealt with by using additional insulation across the outside face of the wall. The exterior insulation is typically some type of rigid foam that can receive the rain screen design. The interior surface of the vast majority of homes being built today, regardless of style, is drywall, also known as gypsum board. Rather than dwell on this we will just acknowledge its primary role from a performance standpoint. It is the final air barrier, so it needs to be taped and sealed properly. This can get tricky in locations we call penetrations such as boxes for electric outlets and light switches, but the windows and doors also provide a sealing challenge as well as being a blog category unto themselves. There are an abundance of wall assemblies, designs, and even proprietary systems available. This has touched on some very basic general concepts that are probably geared toward more conventional frame construction in non-severe climates in the United States. You will hear people say that a house can be “too tight” or that you can insulate too much. Its true that a house does need to maintain an adequate fresh air supply and that you can reach a point of diminishing return with regard to insulation, but that is what design is about. Understand your climate, and your building orientation. Design your wall appropriately. If you can mitigate moisture, remain relatively air tight, and insulate as much as possible, you will have a comfortable house, with minimal energy use and excellent air quality. In other words, it will be just right. The walls of your new house are a very complex system. They provide structural support for your floors and roof, they keep water out and conditioned air in. Plus they need to look good too! There are other functions, but these four primary roles are: aesthetics, structure, moisture protection and air-tightness. We'll discuss all four of these in a two-part post. In part one we're going to focus only on that first function, aesthetics. Aesthetics is something we all care about because the visual appearance of our home is a big part of how we experience and enjoy our spaces. The color, shape and texture of our walls is one of the first things you see when you look at a house. It's the first impression, the curb appeal. In the early styles, there were a limited number of material choices, so most houses were either brick, siding or shingles. These materials were tasked primarily with keeping wind, rain and snow out. The shapes of the materials were used to make both structural and stylistic gestures such as brick arches and coursing or accentuated trim work and trim detailing in wood veneered structures. Often the early colonial styles would try to mimic classical architectural elements such as pilasters, cornices, and window surrounds. While the pre-war period featured an array of historic references, post-industrial revolution mass production led to a surge in very affordable sturdy housing that was less concerned with stylistic detailing, and more concerned with mass production and economy. Think Sears and Roebuck kit houses. As the turn of the century approached and passed by, informal lifestyles and the adoption of more open plans which allowed for new compositions in house forms that allowed architects and designers to take a new creative approach with how to clad the exterior wall systems. There are literally too many subtle distinctions in material options to name them all, so let’s keep it to a manageable few of the primary choices we use in housing today. To break down the aesthetics characteristics of these materials, lets observe them from the perspective of Composition, Color and Texture. In most historic masonry structures the brick or stone exterior walls were load bearing. Today most houses are framed in wood and the masonry is just a veneer. Red painted brick at the Logan Circle historic renovation project. Brick, Concrete Block (CMU) and Stone are the most common forms of masonry exterior wall surface used on houses in the United States these days, but masonry can include a variety of materials such as cast stone, granite, limestone and even adobe. Composition: Brick can be arranged in different patterns referred to as “bonds” and different courses (rows). Bonds and courses can be used to accentuate openings in the walls, create bands and fields, and break up the scale of the surface. CMU and stone can both be used to create fields of material, or bands and water tables, to break of the scale of the building. Color: Masonry typically comes in a variety of earth tones, but it can also be glazed to take on brilliant colors. The mortar is another color consideration with this material, giving the opportunity to either complement or contrast the color of the masonry. Stone is often used to show off its beautiful natural color, and the variety of colors in the stone can often be complemented by other colors in the composition. Texture: Masonry is usually rough, however a glazing can give it a shiny reflective finish. The masonry units can be either the standard course face or a split face, which gives a very rusticated look and can contrast nicely against a smoother material. Stone has a huge variety of textures based on the type of stone, how it was quarried and how it was finished. Light grey brick at the Bethesda Classical Renovation. Cedar shingles over a brick watertable at a custom new home in Potomac. Composition: Wood siding is usually either planks or shakes, and wood veneer panels are also an option. Though the siding can be from any number of wood species, woods like Cedar and Redwood have won favor over time due to their durability. Color: Color comes down to whether you are painting or staining the wood. Stain allows for some color variation while still maintaining the beauty of the natural wood grain. Painting allows you have more ability to control color and to create compositions based more on color rather than texture. Texture: Wood allows an enormous number of textural opportunities. Mixing siding and shakes, orienting the siding vertically or horizontally, widening or narrowing the reveal of the siding. Painted fiber cement panels by James Hardie. Takoma Home Office Renovation. Cementitious or Fiber Cement siding is made from cement that is reinforced with cellulose fibers. It started to become increasingly popular in the 1990’s as a substitute for traditional wood siding. It too comes in plank and panel form and can even simulate a shake appearance. It has a reputation for being a cost effective more durable alternative to wood. Composition: When used with aluminum trim products such as Fry Reglet designers can make interesting and beautiful compositions in a very contemporary style. With the more traditional styles it mimics woods quite well though curves and bending are a challenge. Color: Cementitious Siding can be painted, and there is also an increasing number of factory finished colors that the product is available in. The factory finish is more durable and of better quality. Texture: The product started out trying to simulate wood, and it can do this quite well, but in its panel form it can allow for large fields of smooth texture. In its plank form it can be either smooth or have a wood grain texture, and the panel form can be either smooth or simulate a stucco texture. Stucco is just a cement plaster that is applied as an exterior finish to a building. It has been around for many centuries but more recent versions of the product include EIFS (Exterior Insulation and Finish System) that adds some science to the mix, which will be covered separately. From an appearance perspective it mimics traditional stucco. Composition: Stucco is incredibly versatile in its ability to form limitless compositions. It is a fluid application so it can basically take on the shape of the substrate it is covering. Curves, bulges, large smooth fields, odd shapes. It is very sculptural and versatile. Color: Pigments can be added to the stucco system or it can be painted. From both perspectives it allows a great deal of flexibility. Texture: There are a variety of textures to stucco from relatively smooth like a heavy sandpaper to very bumpy like “popcorn” stucco whose name is appropriately descriptive. Though it is not very common in residential houses, glass panels can be used an exterior surface, though they can be quite expensive as a cladding system. Color: Glass comes not only with a wide variety of beautiful color but its transparency or translucency gives it a unique aesthetic range in color and how light interacts with it. Texture: Though glass tends to be on the smoother side of siding materials it can have some texture to it, but it si typically used as a very smooth finish. Fiber cement panels with aluminum reveals. Potomac Contemporary Addition. Composition: Depending on the panel sizes a variety of compositions can be created, but it will tend to work best with more contemporary compositions. Color: Pigments can be embedded for the superior factory finish but the particular product with establish your color palette and range. Texture: as with all engineered products the texture is ultimately based on how the manufacturer offers the product. Panels lend themselves to a smoother finish, and as they become more textured their ability to hold dirt can become a concern. Though windows are their own topic and will be discussed separately, any discussion of wall aesthetics or performance must acknowledge that windows are a dominant element in how a building looks and performs. Whatever the wall systems that are chosen, they must interact with the windows in a manner that unify the exterior of the building and balance the composition in a pleasing and beautiful manner. What style is my house? A common question among homeowners wishing to better understand the design of their home. It seems simple enough, but with most things, the more you begin to learn the more complex such a simple question can become. The go-to book in this category is “The Field Guide to American Houses” by Virginia and Lee McAlester. The authors break down the style of American homes into six major categories, each with a handful of sub categories, resulting in approximately 39 identifiable styles of American Homes. We’ll take a more in-depth look at six of these categories commonly found in the Washington DC metro area. First, let’s have a quick lesson on three key architectural terms that are vital to the understanding of style; Scale, proportion and pattern. Scale: Scale and proportion are similar, but when we talk about scale we are generally speaking about how the size of the building or building elements relate to the size of a person. This could also mean how the size of the building relates to the neighborhood or surrounding built area. Proportion: Proportion is used to describe how the size of elements within a design relate to each other. Large objects may be out of scale compared to a person, but still work within the context of the design because they are in proportion. Think about the columns at the Parthenon. Pattern: In the context of this writing, pattern describes the visual arrangement of building features as viewed from the street. How the rhythm of elements such as windows, columns, materials changes, and accent features such as brackets, are used. People are pattern seekers and symmetry is a pleasing and easily distinguishable base to a pattern. Many styles discussed here lend themselves to asymmetry and pattern can be an effective way to bring asymmetrical massing together. This is a very general category, most commonly brick, two stories, flat front, symmetrical windows with shutters, a small portico or porch and a center hallway. As the name implies, Colonial architecture began in the early and mid-Eighteenth century American colonies. As with most preindustrial styles the materials tended to be regional and easily transportable. Glass could only be made in small sizes, leading to multi-paned windows. Brick color was limited and metals were scarce and expensive, so joinery was much more important with so few nails. Scale: As with most historical styles that predate the industrial revolution human scale was almost always imposed by the way a house had to be hand built. Even large old colonial houses have an intimate scale in their detailing. The bricks are small and approachable, and if the house is clad in siding even that is made of many small identifiable pieces. As with all things small it is invariably cute. Proportion: A Colonial house usually has a center hall with a room to either side. This results in a symmetrical front elevation. Most people either like symmetry, or at least acknowledge it is the basis upon which the human body is designed. It has a place in our hearts, even if our hearts chose to break that rule and skew to the left. The symmetry of a Georgian floor plan results in a front elevation that approaches a proportion that is at least similar to the “Golden Section” which is a topic unto itself but let’s just say its withstood the test of time as an important standard in pleasing proportion. Colonial architecture will typically have a single material covering the entire façade, and so windows and doors are the primary elements that break up the monotony. We often see four windows and a center door on the first floor. Five smaller windows on the second floor will stack over the first floor windows. If there are attic dormers they will be even smaller yet, and align with the spaces between windows. This layout establishes a repetitive horizontal pattern that is also reinforced vertically with a diminishing scale. “Five, four and a door” is a quick idiom to remember the pattern of a colonial façade. Shingle Style originated in the late 1800s and was adopted by many of the Robber Barons and their esteemed architects for homes of leisure. Think Newport Rhode Island or the Hamptons, though many beautiful examples exist on a smaller scale. Scale: As with Colonial architecture the scale relates very well to the human form. 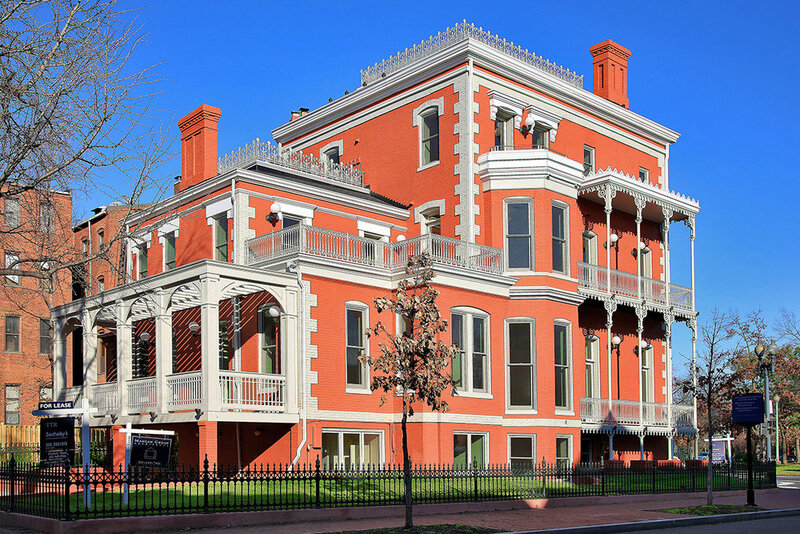 Porches, balconies and dormers visually break up the mass of the building into more human-sized elements. Eaves that go all the way down to the first story also help to break down the scale of larger houses. 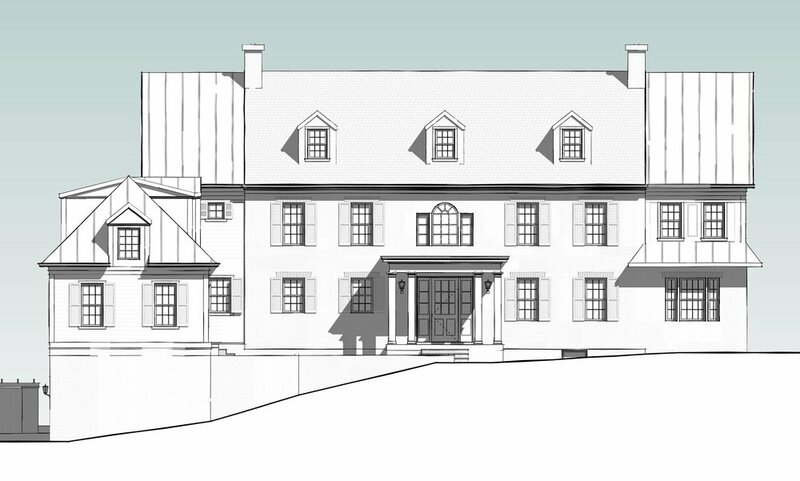 Proportion: The forms of Shingle Style houses can be can be more complicated. As the Field Guide states, it is “a complex shape enclosed in a smooth surface”. Often a large roof defines the house but is broken up by a series of gables, dormers and bay windows to create a composition. These elements are often each properly proportioned and then used as part of a complex composition of shapes that are all part of a greater whole. Pattern: The style gets its name from the continuous cladding of shingles. This was uniquely American and any patterns here are typically brought about by the elements such as windows and porch columns that repeat in often seemingly random patterns. It is a complex style. Strips of three or more windows is one identifiable pattern, and within the windows themselves we see multi-pane top sashes over single pane bottom sashes. Curves are a notable feature, often used in eyebrow windows, walls and flared bottom edges of siding. Prairie style is often associated with Frank Lloyd Wright as he was a principal innovator of this style during his early career. The Field Guide dates it between 1900-1920. Visually it is defined by low slung horizontal lines, hip roofs and deep overhangs. Even the bricks used tend to be Roman Brick which is very long and narrow. It originated in the American midwestern prairie as its name implies, however with the rise of plan books, and the rise of the railroads, this style was quickly transported from the mid-west to the east coast. 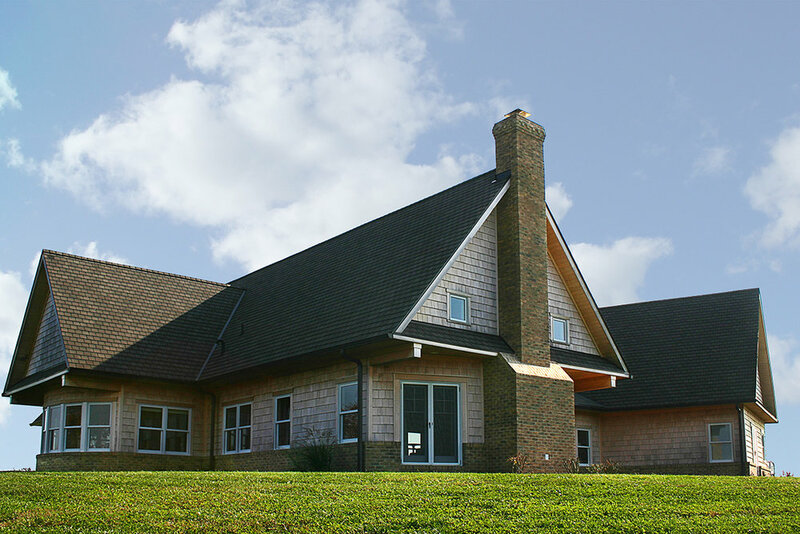 Scale: Like the Shingle Style, a Prairie Style house can work with both symmetrical and unsymmetrical volumes but its overriding feature is strong horizontal lines that are often reinforced with a very deep overhang at a second story eve. Though the houses are not necessarily large, the elements such as porch columns or wide bay projections can take on a massive scale. Proportion: The resulting proportions of the prairie style break from the Golden Section principal that guide much of the colonial proportion. The resulting long and flat volumes tend to ground the house and make one look outward rather than upward. On occasion a two-story element such as a massive chimney or a window bay is used to break the horizonal lines. This contrast can be quite balanced and appealing. Pattern: Again, as with the Shingle Style the larger massing is broken down and typically windows and porches are used to develop pattern and sequence. Often the resulting two-story elevation is further divided into horizontal masses with material changes. The first story material, often brick is carried all the way up to the sill of the second story window, grounding the house. Then repetitive windows, in groups of four or more create a vertical rhythm in this horizontal mass. The second story appears to float above this and additional patterns of windows, siding or stucco panels run horizontally, all under a massive overhanging eave that further grounds the house. Craftsman style shares the low sloped roofs with the Prairie style and porches and porch supports are a very integral part of the style. Bungalow houses are the most prevalent example of Craftsman style architecture. Craftsman has had a big comeback in recent years, though this has been aided by less-informed builders adding brackets and other ornamentation to a non-descript home and calling it Craftsman. Though American Craftsman style architecture originated in 1893 in California, the style has its roots in the English Arts and Crafts movement, which was a reaction against industrialization. Once again the “handmade” feel is present in the elements. As with the Prairie style, Crafstman architecture traveled east through plan books and became quite prevalent in the railroad suburbs of the northeast and mid-Atlantic. Scale: As with its inspiration from the European arts and crafts movement there is a desire to look handmade and small-scale elements such as brackets and trim work are emphasized. Often the eave line comes down to the first-floor level further emphasizing the human scale. Proportion: Again, as with the Prairie Style, Craftsman can tend to be low slung in scale however, like the gable features in the Shingle style the massing has a vertical aspect. Whereas the Prairie often creates a visual that makes the roof disappear, the Craftsman makes a sloped roof a defining part of its massing, but tends toward straight and angled lines as opposed to curves. Pattern: The Craftsman Style is often dominated by a single roof, and secondary patterns are developed in the detailing through the use of brackets in gables, porch columns and windows with grilles only in the upper sash. Patterns are used to reduce the scale of larger elements. A typical Craftsman example would be the use of five or more brackets in a deep overhang to break up the mass of a large reverse gable at the front of the house. Each bracket in turn would have more intricate detailing, adding further depth to an otherwise overbearing physical structure. This is not a Style unto itself. After World War II mass production, the GI bill and new means of financing combined to revolutionize housing in America, arguably at the expense of style. As urban flight and the automobile took hold starting in the late 1940’s, suburbs such as Levittown arose with a mass-produced cookie cutter version of inexpensive but often durable housing. These houses were viewed more as a commodity and produced with efficiency in mind. Standardization and production of building materials on a massive scale and the ability to transport these materials such as plywood and drywall started to de-emphasize regionalism on a large scale. There are a multitude of styles of this Post War American housing but for brevity lets focus on three primary house types. Typically, a one-story house with a partial second story under a simple roof. Often these houses had a modest kitchen, eating area, and living room which doubles as an entry foyer. They may have one or two bedrooms on the main level and possibly an additional bedroom or two on the upper level in the roof. Often two or three dormers project out the front broad side of the roof. This is a one-story rambling plan, sometimes called a Rambler. It typically has an open plan and its origins trace back to California. The open plan lends itself to a less formal lifestyle, and exaggerates the size and feel of the interior spaces. The elevation from the street tends to be long and somewhat non-descript. The Split level simulates the idea of three story living in a compact manner. It was also somewhat more adaptable to a non-level building lot. The plan can be split either from side to side or from front to back. One typically enters on the main level with kitchen, dining and living. One can either go down half a level to a basement or family room or up half a level to the bedrooms. Sometime there is an additional level below the main level which is effectively a basement. These post-war houses, especially the Cape Cods and Splits tend to be on the smaller side, though some ramblers grew to be quite large and in short order transformed into a whole new variation we will address under the heading of Contemporary. Scale: The post-war communities in which these houses were built can be of an enormous scale, and the shear repetition can be overwhelming. Pattern: Again, this was created as an inexpensive mass-produced type of housing so the idea of developing or using a pattern was not of primary concern. A portico or porch would be flanked by windows but there was seldom any opportunity to develop patterns with either eave lines or details. Over time homeowners might add trim or features such as porches or bay windows to improve curb appeal but this has been done over time and on such an individual basis that these enhancements often defy the ability to be a recognized pattern. Where are we now? Architecture by its very nature reflects the time and place it in which it was created. Modernism was once contemporary until it became an identifiable style. Style in the past tense is different from Style in the present tense. Style 6: Contemporary: Contemporary architecture tends to be more about form and composition. As a style it can include a wide variety houses but much of it has its roots in what the Field Guide calls the International Style. It lends itself to expressing broad areas of material, and minimalizing the fussy details of the more historic styles. Scale: Though the size of the house is not related to the contemporary style, the scale of the elements is often a bit larger. You might have a large two-story area of a siding material surrounded by a slender band of an accent material. The scale is a bit more random than the historic styles, sometimes being intimate, and sometimes being quite massive. Proportion: As with some of the other styles the Contemporary Homes are often a composition of several forms which in of themselves may highlight either a horizontal of a vertical proportion but typically try to balance the entire composition. Pattern: Patterns are less repetitive and move compositional. You might have a corner wrapped in siding abutted by a large solid panel. The contrasting patterns of the materials would try to complement one another, so the smoothness of the panel would be accentuated by the texture of abutting stone or wood siding. What style is your house? Your house invariably has a story to it, and knowing its style will help you understand that story. It may affect how you think about your house and houses in general. It may make you appreciate why things were done a certain way in the past, and help you decide if it makes sense to do those things in a different way in your situation. A new YouTube video highlighting our Schematic Design process.